Last summer, I had a really steady content development plan, but this summer is more challenging, and now that we are in the second half of June, I need to really start thinking about just what I am doing, and also how I can take advantage of the different online platforms that I like (Blogger, G+, Twitter, Pinterest) and a new platform (Known), along with great new features at Inoreader (IFTTT integration!). It would be good to come up with some good content development habits and routines this summer so that I can then make a smooth transition into the Fall semester. I had a good set of content habits in the Spring semester, but family troubles got me off kilter, and I never quite got back into a routine after that. So, now is the time to think about the many different things I'd like to be doing... and then I can see which ones seem likely to stick! Bestiaria Latina. 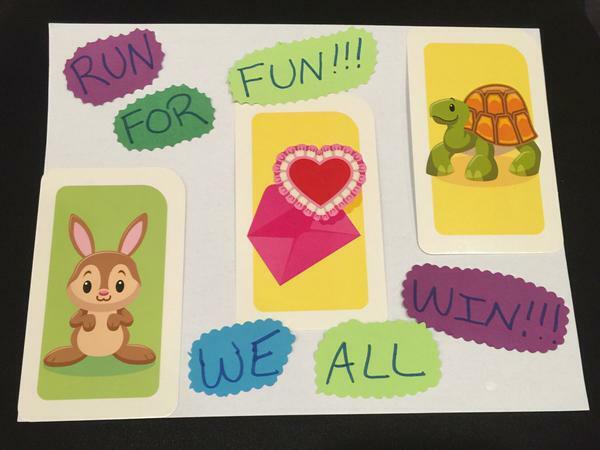 This is rolling right along, and I am so glad to have Amy Burvall's great videos to add in to the mix, like in this post which features her Pompei. Class announcements. I need to start going through the mountain of stuff in Inoreader to look for items to share as class announcements, either in the Announcements blog (backdated) or in the Writing blog. I've got the "notbookmarked" label in Inoreader to help me out, but I really need to dedicate some time to this each day. Amar Chitra Katha. Doing a comic book every day is working out GREAT. That has been a real anchor for the summer now that I have gotten into that habit. So, smooth sailing there at the ACK blog. Indian Epics books. I'm clearly going to end up with a lot of books available for students to read that do not have Reading Guides (yet), so I need to get into the habit of writing up blog posts for those books now so that they will be ready for students to choose and use if they are ready to go on their own without a Guide. Maybe I can try to do one of those per day also. Indian Epics Reading Guides. I'm definitely behind on these, and I need to go through and strategize about which ones to do in which order to make sure I am ready to go when Fall comes! Indian Epics images. I had a great routine for cycling through Indian Epics images, choosing one per day to profile. That can be an old image, or maybe a new one. So here, again, I need to get into an image-per-day routine... although at this point, I probably should be doing 2-3 images per day if possible (recycling and/or posting new). Maker Challenges and Tech Tips. This is also something I cannot afford to put off. I need to start writing up at least one or preferably two of these Challenges per week, along with adjusting the Tech Tips accordingly. Okay... I can do this I think because these all sound like so much fun! I need to start tomorrow on getting a good spreadsheet running to see just how these all go and figure out if this will work as a set of daily practices! Because August is going to be here soooooo soon. DML 2015: Day One... WOW!!! DML Day Two... a few days late! 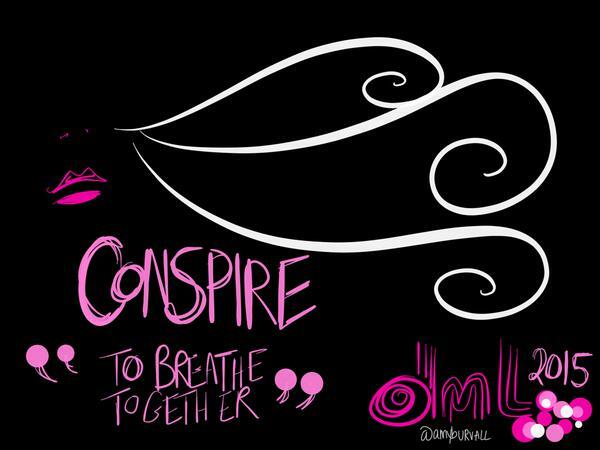 THANK YOU to all the people who presented and participated for a wonderful time ... and here's just one of Amy Burvall's many DML drawings: let's conspire! 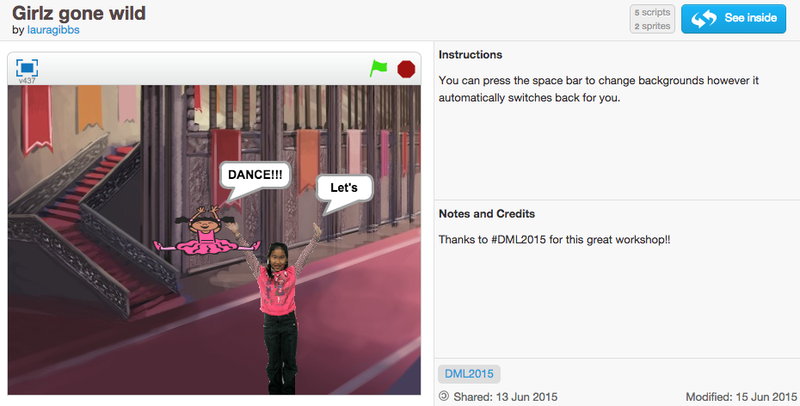 Here's a look at the #DML2015 Twitter stream! SCRATCH. 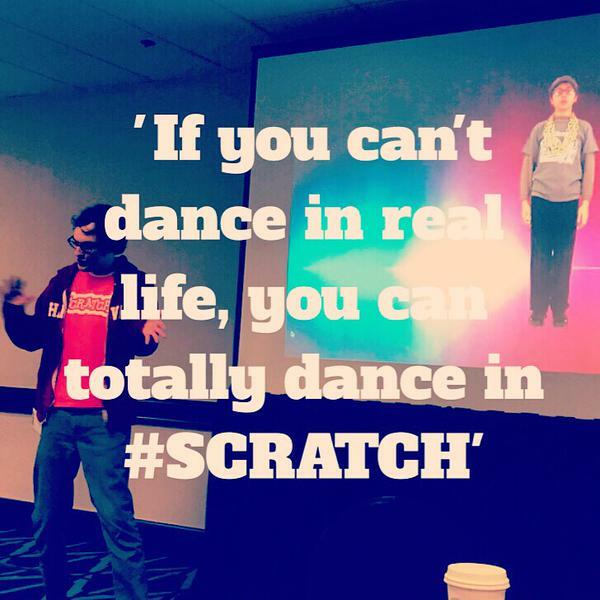 This is a session which I was really looking forward to, and it was even better than I expected: total fun and also very informative: Hip-Hop Dance and Scratch: Interest-Based Pathways into Computational Fluency. Kudos to the presenters for creating an experience so that we were able to connect with one another and so that all of us, even total Scratch beginners, were able to have a successful experience. I loved it! I got to work with Aina Braxton, who was someone I had met earlier; she had asked a super question in our panel, so I had sought her out later to talk, and then she showed up for this session! Here's the dance we made: Girlz Gone Wild. I also got a chance to connect up with Karen Page of Tech Summit Africa again, since she had a table there in the Cafe. I am so impressed by the work she is doing! But here's the thing: the Cafe was pretty much deserted when I was there, though, and it didn't feel much like a Cafe since we didn't have coffee in there or in the adjacent meeting commons. The Cafe is a fantastic idea, but it might be better to have scheduled it to run during the lunchtimes on the earlier days; I certainly would have gladly stuck around and visited Cafe presenters while munching on a bagel and having a coffee instead of going out for lunch on Thursday and/or Friday. And maybe knowing that attendance is going to drop off on the afternoon of the last day it would make sense to schedule fewer sessions during that time...? That was the one event I attended that didn't have the wonderful vibe and energy of the other events, just because there was not the critical mass to make it come to life as the other events did. And then... that was all the end! I went out for a fun walking-around adventure after leaving the Cafe, and that brought the wonderful DML fest to a close. It was a fantastic experience in every way, and I am really hoping I can come back again next year. I wanted to get these notes written out today (Monday) after getting home, and then over the rest of the week, I'll write up in more detail some specific ways in which I want to change and improve my courses for next year based on the great ideas I learned from the presenters and other people I met at DML! After Day One of DML, I didn't go out to dinner (too tired! ), which meant I wrote up a blog post about that day: Day One: WOW. But on Day Two I went out for dinner afterwards, and on Day Three I had nice LA adventures after the final session, and then I spent a day traveling. But now I am back home, and ready to rewind to Day Two and all the good stuff I got to see and do on that second day. One of the themes that Nichole talked about what the importance of public spaces and visibility, sharing ideas and accomplishments so that you can inspire others: "I can do it too." And also: "I need it," tapping into what really matters to people, helping them to build social and educational capital, being able to make the choices that they confront, which can be incredibly difficult choices and complex systems to navigate. She also emphasized the idea of personal history, personal journeys, and how collecting data can help with that; one of the mottoes (I think this one came from Brother Mike) is "learning as a lifestyle." The examples she gave for data use were really compelling, so different from the kinds of data analytics that I see being hyped in the higher ed ed-tech world. She also talked about distributed mentorship, which resonated perfectly with what I learned in the Fan Fic presentation on Day One. 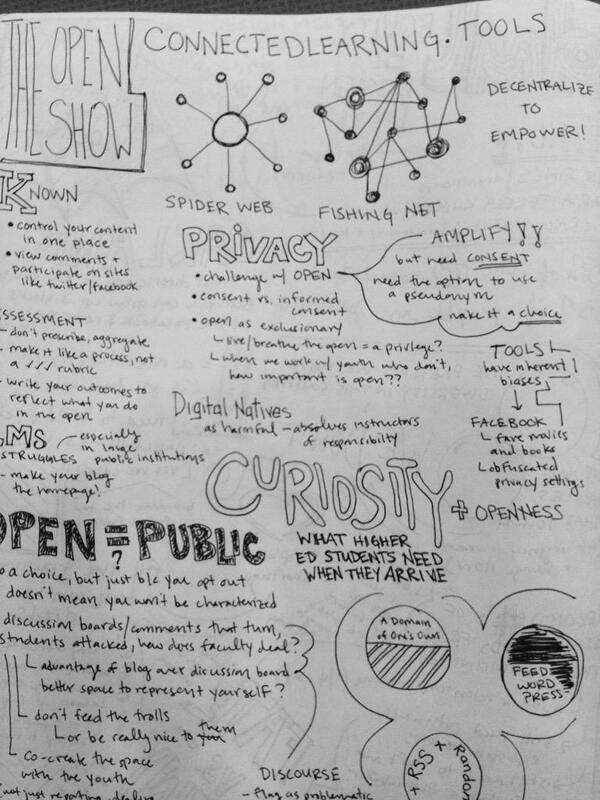 Critical Curation of a Collaborative Media Feed: This was so thought-provoking for me! Kyle Booten is a grad student at Berkeley, and he reported on an experiment conducted in an undergrad education class he was teaching. It gave me so many ideas for things I might want to try, and it also made me feel better about the problems I've been having getting some good Twitter momentum going in my classes. His experiment used a collective Twitter account (he shared the account name and password with all the students) that was for curation purposes, so the idea was not about tweeting but instead about following accounts in order to create a useful class resource. It was up to the students which accounts to follow and unfollow relating to the topics they were working on in the class. I loved the way this was a collective endeavor, and I think that approach could help me get some Twitter momentum going; having students do individual Twitter activity was just not working really well as my students either are not Twitter users to start with or, if they are, they are using Twitter really as a messaging app, not as a tool for learning and networking. Kyle's experiment showed that even these education undergrads at Berkeley did not start out as being very proactive and self-aware about using Twitter as a tool for learning and educational networking, although they were able to use the experience to think about that and explore new ways of using Twitter over the course of the semester, not so much through direct instruction but instead by reflecting on the results they were seeing from their collective effort. Just like with the Fan Fic panel, this gave me so many ideas to think about that I need to write up a separate post. Anyway, it was really super: a simple experiment, but very revealing and prompting all kinds of possible variations and follow-ups. I talked to Kyle again later and met Glynda Hull, the faculty member he is working with at Berkeley, and she told me she is doing work in India. What a great connection to have made; I am really excited about this! Domain of One's Own. After lunch was the fantastic presentation by OU's own own Adam Croom as part of the Domain of One's Own panel organized by Mikhail Gershovich. Adam presented some really great examples of projects going on at OU's create.ou.edu, and I hope he will find a way to feature those projects at the create site itself; right now it's not easy to "see" what is going on without some pointers and links, in addition to the actual content stream. I was really struck by a collective commentary project that someone from OU's Expository Writing project has set up; afterwards Adam let me know some more of the technical details and it sounds really do-able. One of the nursing instructors from CSU Channel Islands, Jaime Hannans, presented on her experiences with open teaching and her students' blogs, and Mikhail showed some of the work they are doing at Emerson. Tim Owens was also there to speak both about the amazing results at Mary Washington and also about some behind-the-scenes details at Reclaim. There was a good discussion afterwards about technical issues but also the broader questions about open pedagogy and public sharing as an alternative to the LMS. I also need to check out perma.cc which Tim brought up in discussion re: link rot (one of the reasons I am thinking I want to stick with my current system of working with student projects is that it will do a better job of avoiding link rot than investing in a system which is going to disappear when students graduate). What is Open For? This was a couple hours of pure fabulousness, thanks to Mia Zamora, Howard Rheingold, Nik Koyama and David Preston. Listening to their own stories was inspiring as always (I know Mia and Howard already, and I had heard Nik and David in a great Connected Courses hangout), and then we had a really fantastic break-out session afterwards, prompted by some good questions from the presenters. As a result, I got to have a wonderful talk with the awesome Gardner Campbell that way (the first time we met was at that session!) along with Karen Page and Janis Selby Jones, two wonderful women I kept encountering at the conference again and again (it's a sign!). David's "Open Source Learning" sounds very congenial, and I need to get more involved with that. After the Ignite session, I went out to dinner that night with Gardner (it felt like going out with a celebrity after that radio talk! ), along with Kim Jaxon, Alan Levine, Tim Owens, and Amy Burvall; what a great bunch! We had too much fun... hence the lateness of this post about the wonderful Day Two of DML. At dinner, Amy shared some of her History for Music Lovers videos, and those are going to be part of the Bestiaria line-up as you can see already in the Bestiaria post for today, featuring her Pompei. Whoo-hoo! I had a great time at the Saturday events at DML ... and then in the late afternoon, I was ready for a bit of adventure! I had really hoped to go to the LACMA, but there wasn't really time for the bus trip out there and back, so I decided to take Alan Levine up on his suggestion about the Last Bookstore over on Spring Street, about a mile from the hotel. What a great suggestion!!! The sun had finally come out, and it was a fun walk past Pershing Square to get there... and the bookstore was as wonderful as expected. 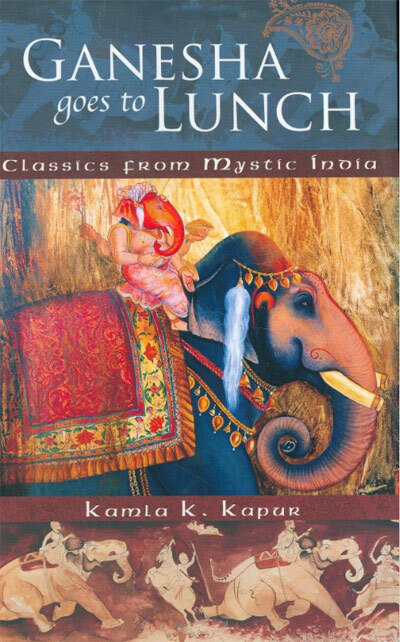 I bought four books, including one that is really exciting, a beautiful book of Indian myths retold by Kamla Kapur: Ganesha Goes for Lunch. And I see it is available for Kindle, so I will have to make sure that I add this to my Kindle list for the Indian Epics Library Kindles! Inspired by this lovely book, I decided to go find the Indian restaurant that had been listed as near the hotel: Gill's Indian Restaurant down on Grand Street, which was about a mile from the Bookstore, putting me almost back at the hotel (Gill's is just three blocks from the Sheraton). And what an intriguing place! It's actually inside the Stillwell Hotel... and hanging in the lobby of this odd, old, eccentric hotel are some beautiful tapestries from India! The woman at the desk told me that the owners of the hotel are from India, and the tapestries are from their personal collection. They were BEAUTIFUL. So that scratched my art itch! It was hard to take pictures of them with the lighting as it was, but I did my best. You can see more pictures at the Flickr album (or see slideshow at bottom of this post); here is one that gives you a sense of what they are like. Isn't that lovely? The food was really good too: I had a vegetarian thali and chose the began bhartha (eggplant) as my vegetable, and then there was naan (very good naan! ), basmati rice, raita, aloo matter (potato curry), dal (the dal was really excellent! ), and kheer for dessert. And I ordered onion bhaji too... I couldn't help myself! So delicious! So, here I am in this comfy hotel room at DML 2015 on Thursday evening, so exhausted but also excited from the day's events that I decided not to even try to go out to dinner tonight... I'm here in the room nibbling Hob Nobs (THANK YOU, LAURA RITCHIE! ), drinking decaf coffee (because seriously, I need to go to sleep sooner rather than later)... but I wanted to write up some notes now, tonight; tomorrow is bound to be full of wonderful stuff also, so I need to write down things from today before heading to bed. Presentation! Then we had our Open Show panel, and kudos to Alan Levine and Jonathan Worth for deciding not to do a presentation in the usual way, but instead just to have a conversation with people from the audience asking questions and back-and-forth, and so instead of a discussion of tools per se, it was a discussion about teaching and goals and strategies, which is of course the real thing, the kinds of discussions we need to have in order to then find/build the tools we need (and of course people can explore our stuff at the very nifty connectedlearning.tools site that Alan and Tim put together for us). I am really excited about doing some kind of group Known site with my classes next year to see if this can be a bookmarking tool we can use together, and Ben Werdmuller and Erin Richey had some very inspiring things to say about the kinds of problems they hope to solve with Known and the directions that they are going in, and I also got some good ideas from listening to Tim Owens who shared about his experiences both with Reclaim and also from UMW. People from the audience brought up so many important topics, and I am so glad to be connected now with Rudy Blanco and to have learned about the gorgeous portfolios that the students are doing at his school. He's doing an Ignite talk tomorrow, so that will be great for sure! (He's at Dreamyard Prep in the Bronx; I need to find out if he is on Twitter... update: yes he is!) And look at this: beautiful visual notes from Cat Greim!!! How cool is that???! Chicago: Digital Atelier. After lunch, I went to a really great presentation on a Chicago public school project, Convergence Academies, focusing especially on a Digital Atelier and also on the different ways that the project provided support and development opportunities for the classroom teachers; I was really struck by a Venn diagram showing the intersections of digital media theory, pedagogy theory, and classroom practice and how they were finding ways to find ways to seek out the intersection of all three. There was also a very good and honest discussion about funding and sustainability at the end. Apparently there are these 3-million-dollar DOE grants to support projects like this, but when you go up to the next level of DOE funding, the mismatch between the funding and the program expectations mean that the projects tend to get diluted, making it very hard to move from what sound like amazing accomplishments in the project focused on a few schools to something that is going to reach more teachers and students. Anyway, it was great stuff; I really enjoyed the discussion of how mentoring works in this informal learning space, so that the learning is very much self-directed by the students but with strong support from the staff who are there to help. 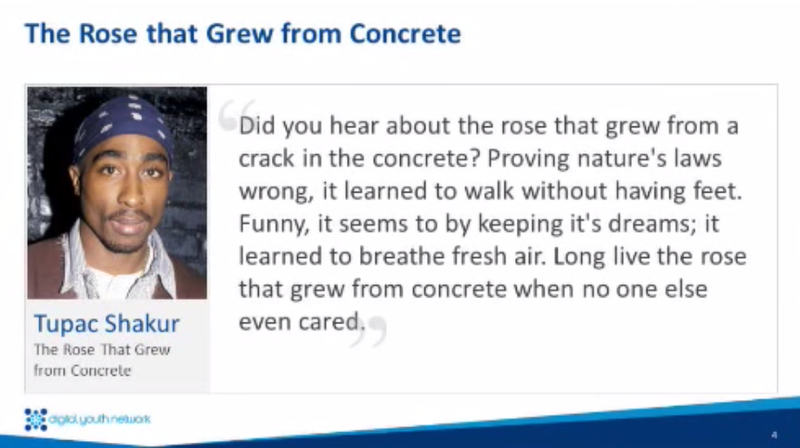 They take this idea of "constant challenge" very much to heart and apparently even teachers who are were at first very committed to direct instruction ended up being advocates of project- and inquiry-based learning thanks to the opportunities this program presented. Wonderful! Fan Fiction!!! Next was the Fan Fiction panel... but before that even happened, I had met up with some really nice people from The Harry Potter Alliance in the morning, and just talking with them was really exciting. So, the fan fiction panel featured the research conducted this year by some faculty and graduate students at the University of Washington investigating what they call "distributed mentoring" fan fiction communities, specifically in Doctor Who, Harry Potter, and My Little Pony (which does ... OMG ... have a Doctor Hooves character...!) 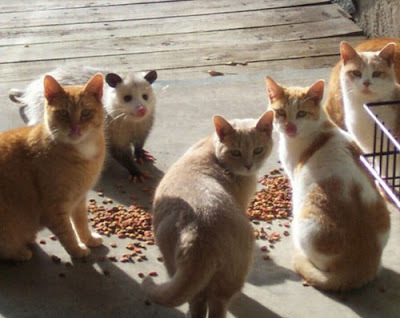 fan fiction communities. And really, I just have to say WOW... I have never found anything that intersected so strongly with what I do while at the same time giving me all kinds of ideas for new ideas and approaches I might experiment with. I'll save that for a separate post because there is so much to say about that, and I need to do some serious brainstorming to see how I can learn from what these fan fiction communities are doing so well. And yes, it is one of my goals in life to write Star Trek fan fiction... specifically, I want to do an anthology of Aesop's fables as told by the different cultures of Star Trek, so I have purely personal reasons at work here too ha ha. Anyway, the people on the panel were so nice, with great people in the audience also. Just to take one example, I learned about Fold.it - so cool I have to make sure to share that with Cody! Ignite! And then, one more set of presentations: Ignite Talks, just five minutes... powerful stuff, and so much stuff squeezed into just an hour: Thursday Ignite Talks. 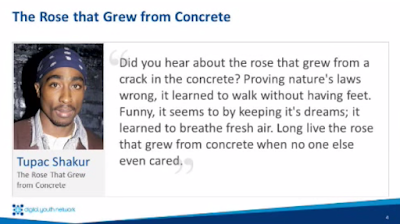 This was also streamed so you can watch for yourself at YouTube (mental note: send this to Randy with link to the part about Chicago kids as city planners!). True confession: I was not keen on the wind-up to get the talks started... but the talks themselves were excellent. They had plenty of energy going on, and we didn't need the random shouting to get that energy sparked. Connected Courses. And then ... (aren't you exhausted already just reading about it???) ... there was a Connected Courses meet-up which was really exciting: I had seen Mia Zamora during the day but had not gotten a chance to really talk to her, plus Kim Jaxon was there, and I also met the wonderful Kimberley Woo who is an elementary school teacher. We are plotting and planning, and I am really hoping that some great cross-connections will start happening if we can build some channels to bring our students together in different ways through some shared themes and projects (and with Rudy Blanco also... so many possibilities!). I'm also really hoping I can find some other educators who want to explore Known as a shared bookmarking tool. So, I am totally exhausted, but in the best way possible. I will go prowl the Twitter stream for a bit to see what I missed from all the other panels that were going on (SO MANY PANELS)... and then crawl off to bed to get ready for more adventures tomorrow. Adam Croom will be presenting about OU's create.ou.edu, Howard Rheingold will be here presenting with Mia and with David Preston (who was one of my favorite people from the Connected Courses hangouts)... oh, so much goodness, plus new things I have never even heard of before too. YES! 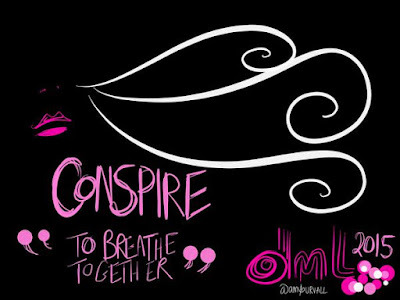 I'm sharing these links here and also with Alan as he preps our nifty website for DML2015. I'm really glad we are going to have that site; the idea of doing a presentation where you have to be a certain place at a certain time is so alien to me (yes, I am the Queen of Asynchrony), but with the website, we'll be able to share a lot of great stuff with everybody anywhere who is interested. I'll be sharing that here when it's all ready to go! Even for people who manage to get to the conference (it's in LA), just choosing which sessions to attend is crazy-making, and you can imagine how terrible I feel that our session is scheduled for the exact same time (11AM Thursday, June 11) as the session about the Prema Film School in Lucknow: “Son Enough”: Enabling Voice, Visibility, Equality, and Agency among Girls in India. Which just happens to be the session I would be most excited to attend of the whole conference. ARGH!!!!!!! How cruel is that????? Course Hubs: RSS can gather up your course blogs so that you can read them in one place and also share that combined stream with others. 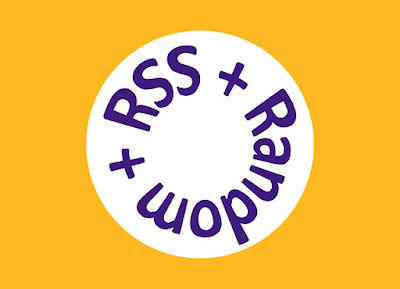 Assignment Streams: RSS can also gather specific content from all the course blogs (like different types of assignments) into combined streams. Inoreader.com: I use Inoreader to aggregate the blog posts, manage my blog reading, and also create combined streams to share with others. Randomized Student Projects: Random content widgets allow you to explore lots of content in a way that is fun and also efficient. Randomized Blog Groups: To help students connect with lots of other students in class, I use a simple spreadsheet to create random groups.